The AFL Women’s draft day was four months ago but I can still remember it better than many things that happened last week. The momentous sense of history was there, like a mountain. And on that mountain was the sprinkling of excitement, anxiety, fear, elation, disappointment. Hundreds of people – players, coaches, media, friends and family – were there, sharing and paring these emotions. It was tight room. One of the many thoughts I had as I got back on the train that day was this: Carlton would be the best side in Victoria and probably the competition. Coaches Damien Keeping, Graham Burgen and Scott Gowans had selected a side full of tough, versatile players who were – shock horror – almost all experienced footballers. They were organised and well-balanced across the field. As far as big name bona fide champions went, they had fired all their shots before draft day: marquee selections Brianna Davey and Darcy Vescio were already signed and would go on to be the toast of AFLW while priority pick Lauren Arnell would become captain. A side full of excellent team players was compiled. In their last three selections, they stole Al Downie – the best ruck in Australia, in this author’s opinion – and two elite defenders in Laura Attard and Bec Privitelli. And Melbourne? They surely wouldn’t beat any Victorian sides. Maybe a consolation win or two over the likes of GWS, Adelaide or Brisbane, who would be exceptionally weak. It seemed to me that their recruitment manager Anthony De Jong and women’s football co-ordinator Debbie Lee had gotten stage fright: no fewer than seven of their 27 players were 20 or younger. Throw in another five who were coming off their first season in competitive football and two more who had literally never played and I was writing my obituaries: the Demons would crash and burn. Daisy Pearce, Melissa Hickey, Karen Paxman and Elise O’Dea, their four elite selections from the Darebin Falcons who had played in just one defeat in three seasons, would shoulder far more of the heavy lifting than they would be able to stand over the two-month season. And they would know the taste of defeat. In the words of Lou Reed, “it just goes to show/How wrong you can be”. The Blues and Demons met at Casey Fields with both sides having confounded my early predictions. Carlton looked like world-beaters against the Magpies three weeks earlier but since then had just scraped past GWS and fell to Adelaide in a match that had shaped the all-important top two. The short season means that every defeat – every quarter, every passage of play, every player – is of magnified significance. I remained convinced that Carlton were the best side… but had they lost their edge? 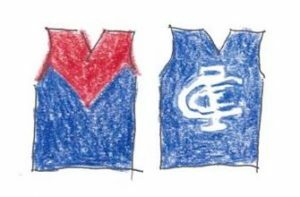 Melbourne had lost their first match against Brisbane in an utterly miserable contest at Casey Fields but had since steeled themselves with a stirring comeback win over Collingwood and had put the fast-fading Bulldogs to the sword. The Falcon Foursome were awesome but what was surprising to me was just how well their lesser lights – Shelley Scott, Jas Grierson, Lily Mithen, Brooke Patterson and Alyssa Mifsud – were shining. Across the board, coach Michael Stinear had successfully developed one of the more skilful sides. Only Adelaide could win possession out of disputed ball better than the Dees. I was still expecting the Blues to win because I believed their depth was better than Melbourne’s. As it turned out, it was the Demons’ elite players who won them the match. Paxman has been the best of the four. Her phenomenal fitness makes her dangerous all game, as does the control she wields over the packs. O’Dea and Pearce are a touch below her in sheer possession but they do an incredible amount of damage with their disposals. The Demons carved out a three-goal lead and really looked like they had the Blues on the canvas before the Carlton comeback came. Kate Shierlaw and Darcy Vescio goaled to tie the square with five minutes to play. How much ya got, Dees? The moment came with a minute left on the clock. Carlton defender Laura Attard came off and their captain Lauren Arnell – experienced, smart and an exceptional leader – came on and ran straight into the forward line. I was nonplussed – the Blues were left a player short in defence, Melbourne forward Richelle Cranston was given a paddock of room in the front half and won the ball off a fast break to kick the matchwinner. It was a great win for Melbourne. I had been proven wrong more times than I could count. Melbourne: Mifsud 2, Berry, O’Dea, Cranston, Scott. Melbourne – Pearce, O’Dea, Mifsud, Paxman, Mithen, Scott. Loved your input here Callum. Well done. We are all going to be bereft of AFLW but we’ll be back watching our local teams and we need to keep the coverage going. It will be interesting to see the standard getting better in the WVFL (and other states) as these women go back to their local teams. Melbourne really stepped up this game. Like your analysis of the teams and their stars as well. Bri Davey is unbelievable.